Hilda is an English steamer which was built in 1882 for service between England, the Channel Islands and St Malo. 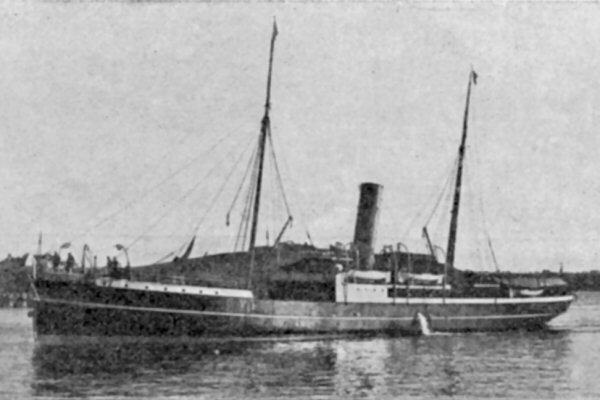 She began her service in 1883 assisted in 1890 by Stella. She then direct service between Saint-Malo and Southampton who made uneventful for 15 years. On 18 November 1905 occurred the most tragic experienced service between France and England. By zero visibility due to snow and wind, the steamer Hilda from Southampton to from Saint-Malo is blocked in the late afternoon at the entrance of the channel of St-Malo. Hilda had taken the 103 passengers and 28 crew members on board. Among the passengers, 75 Johnnies, Bretons who sold their crop of onions in England in going door to door, go home. Other passengers are part of the English community of Dinard. The Hilda remains there for 5 hours, ballot by the waves and gusts of snow. Suddenly, around midnight, the steamer touches on the rocks of Pierres de la Porte to a few hundred meters from the Grand Jardin lighthouse. The guards, however, very close, hear nothing, nor the warning lights or whistles, or even the explosion of machinery. The ship broke in two, the passengers were thrown into the sea ice. In the early morning, the steamer Ada traveling from St-Malo to Southampton discovered the wreck of Hilda and agrippées and 10 people hanging in the riggings that emerges again. Among them, only 5 Johnnies and Grinter, an English sailor are still alive. The other 125 occupants of the ship had found a terrible death, swept away by iced water or struck down by exhaustion and cold.